The spine naturally is made up of a series of curves, which are essential to us as shock absorbers. They transform the spine from a straight, inflexible rod to a spring, which is able to bend and flex in response to the stress caused by the impact of walking, running, and other daily activities. If the spine was completely straight, all of the stress would go straight through the bones, leading to increased wear and tear on the vertebrae and intervertebral discs. The figure on the left is sitting straight, all curves in place, and the only issue from this posture over a long period of time would be slightly squashed hamstrings and tightened hip flexor muscles, which with a good stretch, can be alleviated. The figure in the middle, peering up at possibly a screen, is adopting the ‘forward head posture’, resulting in neck and shoulder pain. Strain all along the spine by leaning forwards on a desk, which over time, can lead to tightened back muscles pulling on the vertebrae, allowing discs to bulge out through the resulting gaps, causing pain and possible nerve problems. The hamstrings are squashed by increased weight thrown onto them from the upper body’s position, hip flexors shortened and resulting in lower back and hip pain. The third figure on the right hand side is also reducing the curves of the body by the slumped position in the chair, once again putting similar stress on the back muscles and vertebrae. The head is also thrust forward to counter balance the lean of the shoulders against the chair back, causing neck and shoulder pain. Although the body of the hamstrings are not squashed in this position, there is an extreme amount of weight pushing down on the top ends of the hamstrings, when the tendons attach on to the pelvis, which will tighten with this added stress, causing possible lower back pain. Any attempt to use a computer from this position is also likely to cause pain in the arm. The best pain-free way to sit is on a stool, so you are not tempted to lean up against a chair back, feet flat on the floor, chin tucked in, elbows resting at you sides. 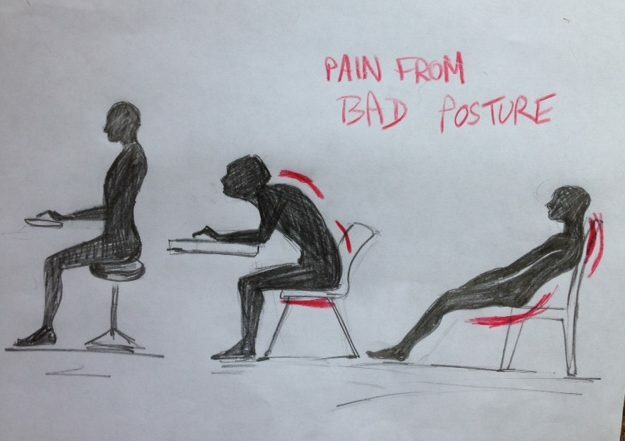 As long as you are sitting on top of your sitting bones in this position, you cant go wrong!